Le Falconer est une villa joliment décorée située à 5 km de la ville médiévale de Spoleto, l’endroit idéal pour se détendre et profiter de votre expérience de l’Ombrie. Il est entouré d'un parc privé de 12 acres offrant une vue spectaculaire sur les montagnes et toute l'intimité que vous pourriez souhaiter pour votre détente. La maison, entièrement restaurée au printemps 2010 et aménagée dans un style typiquement italien, vous accueillera dans des espaces lumineux et attrayants: le charmant salon avec cheminée, la cuisine confortable et les jolies chambres avec salle de bains, toutes donnant sur montagnes et vallée face à la propriété. Entourée d’une oliveraie, la superbe piscine à l’eau salée vous permettra de nager ou de vous reposer paresseusement sur une chaise longue. Pour plus de détails s'il vous plaît visitez notre site Web à torredelfalco. Absolutely perfect in every way. Signora Panichi has created the ultimate oasis. Thoroughly enjoyed my stay here and highly recommend Torre del Falco. Everything was impeccable right down to the smallest detail. From the well appointed kitchen which was fully equipped for experimenting with classic italian cooking to the table and bed linens. The space was stylish and cosy and made for a tranquil and comfortable oasis after a day of sightseeing in the surrounding area. The villa is bordered by roses and rosemary which were in full bloom for my visit in May creating a beautiful fragrant atmosphere that complimented the stunning view of the Umbrian hills. Signora Panachi was a terrific host offering privacy and assistance when necessary. There was even a wood burning BBQ which added to the authentic experience of living the ultimate Umbrian lifestyle if even for a short while. This property had all the comforts including a beautiful pool and a private outdoor area where we could dine and curl up with a book. This is a truly wonderful property with beautiful apartments for a wonderful vacation experience. I would love to stay for a month or longer and look forward to returning. There is much to see in the surrounding area which makes it the perfect base to explore from and the nearby town of Spoletto is a true gem. Thank you Beatrice for creating this magical place. It is a labour of love and I am grateful to have experienced it. Dear Marcie, I deeply appreciate your words and the fact that you fully enjoyed your stay. Making my guests as happy as I am in this place is a very important part of what I am doing here. I dearly hope to see you here again in the future! A big thank you and a hug. Torre del Falco is FABULOUS! Our family of four had the pleasure of staying in The Falconer for 10 nights. The property was even more lovely than depicted in the photos. The scent of jasmine and Rose is everywhere. Each rental has a private seating and dining area. We dined at "home" several times outdoors under the jasmine covered pergola while gazing at the Umbrian countryside. We all enjoyed the beautiful pool. The mini horses and cats were a treat as well and kept our children very entertained. Beatrice is so incredibly kind and offered restaurant recommendations and assisted with train schedules. Spoleto is a gem. We found it to be a fantastic location for many adventures!! Our family agrees that it was the best holiday we've taken and I know that is due in large part to the perfect accommodations at Torre del Falco. I highly recommend this property. We hope to see Beatrice again! Other highlights of our trip: 1. truffle hunting with Wild Foods Umbria (experience of a lifetime); Marmore Falls; hot springs of Saturnia; Orvieto; and getting lost in Italy! Dear Cheri, thank you so much for your kind words! You and your family are adorable and I dearly hope to welcome you here again! All the best! Our family (two adults, two children aged 7 and 8) enjoyed a wonderful stay at the Falconer apartment. It is just as described on the website with two cosy bedrooms, a fully equipped kitchen that provides for everything you need, as well as a large private outdoor space with wonderful views over the valley. It is very clean and thoughtfully furnished with lots of attention to details. Beatrice is a very charming host with answers to any questions you might have, but who does not impose herself on her guests. The shared swimming pool is great, again with stunning views over the valley and surrounded by a lovey rose garden. The children particularly enjoyed the two little ponies and the numerous characterful cats that live on the property and add a particular peacefulness to the place. Spoleto can be reached on foot via a quiet downhill road through the wood, but going up the hill at the end of a full sightseeing day can be strenuous. However, there are taxis, as well as a good parking system in town. Spoleto is lovely, and you can spend hours wandering the labyrinth of roads, steps and squares. The cathedral as well as the church San Salvatore are stunning, and we would particularly recommend to wander the Giro dei Condotti, a round walk in the hills around Spoleto giving wonderful views to the town. Further afield we made great excursions to the Great Plain (Piano Grande), to the towns of Orvieto, Bevagna and Montefalco, as well as to lots of hidden mountain churches and abbeys. We would also highly recommend the 19 km walk between Spoleto and Sant'Anatolia di Narco on a disused mountain railway line. It leads through a few dark railway tunnels (up to 600m) which you should only tackle with a torch, but which add a huge excitement to the walk. Our group of 12 stayed in the Tower and we were very happy with our choice. Staying in such a beautiful and unusual property certainly helped to make our holiday. The Tower is beautifully decorated and furnished and very well maintained - the photographs on the website are a true reflection of its condition. The main kitchen on the ground floor is large and very well equipped - there is everything you need and more. There's also a handy small kitchen on top floor which leads to the Terrace. The terrace has stunning views and was well used by us for both breakfast and sundowners. I noticed another review said the rooftop terrace couldn't be used because there was no shade - this has been rectified and the table is shaded. The property's grounds are truly beautiful - a lot of care and attention is obviously devoted to the garden area. The pool is large and great for lap swimming - great for us. There is a large outdoor table, a double BBQ and the garden is beautifully lit in the evening - wonderful for evening meals. 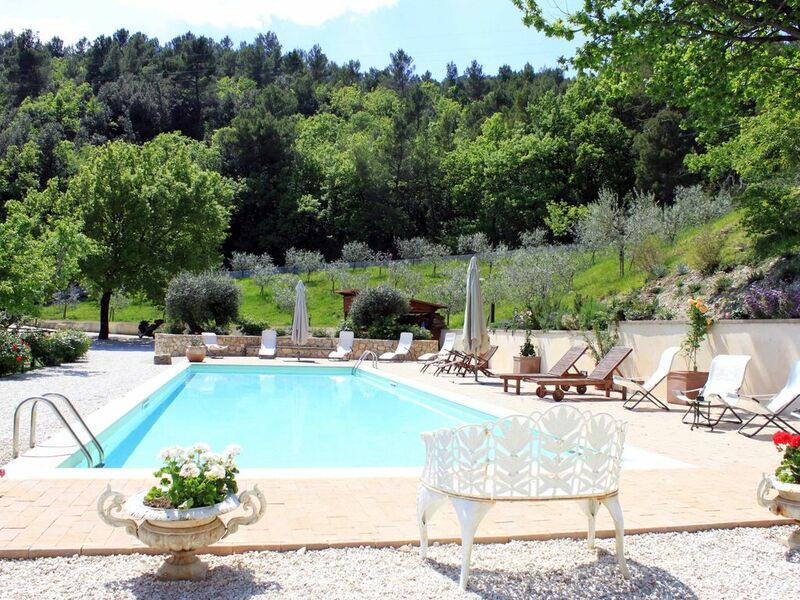 The property is a five minutes (maybe less) drive from Spoleto. It is walkable, although as the property is on a hill, the road is winding and largely unlit - so the walk is less inviting in the peak of summer or at night. Spoleto itself is enchanting, as well as having all the facilities you need and there are just so many places to visit in the area that we will have to go back again to explore more. We also managed a trip to Rome, which only took an hour and a half by train from Spoleto. Beatrice, the owner of the property, was a great host. From our initial contact with her and throughout our stay she was both professional and very helpful. She answered all our initial queries promptly and during our stay she recommended and booked restaurants for us and had great suggestions for days out and things to do. She can also arrange a local cook to prepare meals for you - in the end we ran out of time to do this but would be on my list at another visit. Beatrice lives in a property in the grounds but was very discreet throughout our stay. We had a fabulous holiday thanks to Beatrice, her beautiful property and the surrounding area. It is definitely worth a return visit. J'ai vécu une de mes plus belles vacances à Spoleto chez Beatrice. Le site est magnifique. Vous avez une vue époustouflante sur les montagnes. L'endroit très tranquille, vous n'entendez rien. Les lieux sont très bien entretenu et propre. L'accueuil est des plus chaleureux. Beatrice est sur place pour s'assurer que tout soit parfait mais ne vous importune aucunement. Nous avons resté dans le Falconner qui était parfait pour nous 3. Deux chambres avec salles de bain complètes dans chacunes. Terrasse privée avec BBQ au bois. Les déjeuners devant la montagne étaient tellement agréables ! Le village est à proximité et peu même se marcher. Il y a 2 supermarchés où vous trouvez de tout. Il y a beaucoup à visiter à Spoleto. J'ai adoré "Torre del Falco". Je vous le recommande fortement ! Spoleto a une tradition dans l'histoire et de l'art qui remonte à la civilisation romaine antique. Vous pouvez passer vos journées à la visite du château et les nombreuses églises et des expositions, se perdre dans les rues étroites ponctuées par des boutiques d'artisans, découvrir les goûts de l'Ombrie et de saveurs dans les, restaurants typiques confortables, et terminer la journée assister à l'un des nombreux événements culturels typique de cette ville. Et quand vous êtes fatigués des artefacts humains, vous pouvez marcher pendant des heures dans les bois et les montagnes environnantes, vous plonger dans la beauté de la nature ou d'après les gravures de San Francis long de ses sentiers de retraite. Découvrez les nombreuses villes à couper le souffle dans moins de 30 minutes en voiture: Bevagna, Trevi, Spello, Montefalco et Foligno; ou en une heure, vous pouvez rejoindre Assise, Orvieto, Deruta, Pérouse, Todi, Cascia et Norcia. Rome est 1h 20 'en train, et Florence est à seulement deux heures de voiture.